Yoga is one of the most popular forms of exercise, but yoga classes have a reputation for costing an arm and a leg, especially at the trendiest yoga studios. However, don’t write off yoga classes right away — there are ways to get classes for cheap. While free online yoga videos are a great way to supplement your routine, I would definitely recommend going to a class, especially if you are a beginner to yoga. It is important to move through the poses with the proper alignment while engaging the proper muscles. Without an instructor’s feedback, you are more likely to injure yourself while doing yoga (lower back injuries are common). Never join a yoga studio without first asking about its new student promotion. Almost every yoga studio has one, in varying degrees of value. Some offer the first class for free. Others offer an entire month of unlimited yoga (you can drop in on any of their classes, as many times as you want) for the price of two or three drop-in classes. When I first moved to my current town, I was fortunate to find a yoga studio that offered 90 days of unlimited yoga for $90. Check websites like Groupon for deals offered at studios in your city. These deals are perfect for beginner students, as they enable you to build a foundation in the basic poses, preparing you to do your own practice at home. A friend of mine spent her first two weeks of yoga going around to all of the local yoga studios and taking advantage of their first-free classes. She got a range of instructional styles and gained a basic familiarity with the yoga poses without having to drop a penny. Yoga has become so popular that it is offered everywhere, from community centers to your local community college to the YMCA. Check listings for cheap or free community yoga classes. Some of these classes are by donation, so you pay what you can. If your apartment building has an exercise room, it may also offer cheap yoga classes for residents. My yoga studio offers a $5 community yoga class, as well as a $10 family class, every week as a way to give back to the community. If you’re following a yoga video, Wii Fit, or a book at home, these cheaper classes are a good way to refresh your knowledge of yoga, ask for instructor advice, and join a community of yoga enthusiasts. If you have several friends who are all interested in doing yoga, you might want to consider hiring a private yoga instructor who can come to your home and teach you and your friends. Each of you might end up paying less than if you joined a yoga studio, while the yoga instructor ends up getting paid more. You essentially cut out the middleman (the yoga studio), which gives you more personalized attention and better value. Usually, it is cheaper to buy a block of yoga classes (a card for 10 or 20 classes) than to drop in on each class. Look for a yoga studio that offers class cards with no expiration date. This means that you can spread out your classes over several months without having to worry about losing the remaining value on your card. You can do yoga by yourself at home, and go to a class every week or two to keep yourself inspired. Once you’ve become comfortable with the basic yoga poses, you’re well on your way to developing your own practice. 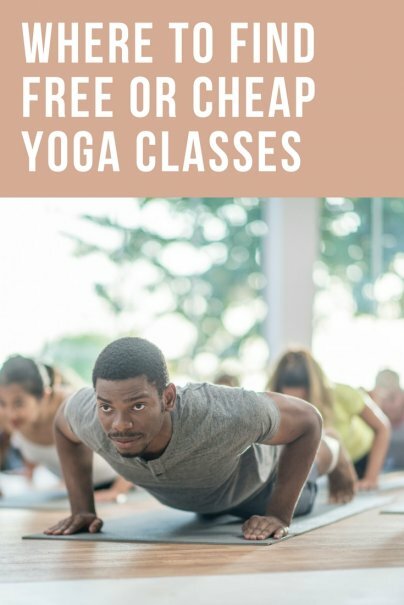 You won’t need to go to classes as often, although you may want to go once in a while to a cheap yoga class just because, well, it’s a great deal. Where have you found great deals on yoga classes? There are some people here at work that have gotten together to form a yoga group. they get together in a conference room a few times a week. I love that idea! Do they do it during their lunchtime? Awesome! Did they hire a private instructor? A lot of workplaces now are sponsoring yoga classes - another perk to employees and a great way to promote health in the workplace. I think it makes employees more productive too! If you already have a gym membership, then you can also get yoga classes for free. Make sure you check out what classes your gym offers or switch to a different fitness center which has more classes. If you are planning to do yoga only, then it is a good idea to see if you know any experienced yoga friend and see if she knows someone who can give you a discount. Sometimes she may also offer to teach you yoga for free! A few of my friends have gym memberships and go to yoga there - sometimes a gym membership costs less than a membership at a yoga studio, and you get to use all the facilities too. The only drawback is that there aren't as many classes, and IMHO, the atmosphere isn't quite as calming. I teach a free yoga class one night a week at our church. It is open to members and also the community. To me it is just one way to give back. That's wonderful. I forgot to mention churches! - Check with your local parks and rec department. My city has free classes going on at several parks this summer. - Look into online classes — YogaToday.com is like the Netflix of yoga. They have a free class each week for all levels and you can buy individual classes or subscribe to streaming access for hundreds of other classes. Yoga in the park sounds lovely. I'll be keeping an eye out for that! I belong to a gym that has the classes included in the membership fee. Some gyms don't though. There's a great smartphone app, Qponomics, to find deals around you (using the GPS) and in many areas in the country, gyms offer membership discounts - just one more way you can save money and still stay healthy. I have the app and I love it! Check it out to see if there's a gym near you! The group classes in the conference was such a cool story! Thanks for sharing! It's a great idea to bring to my coworkers. Also check out http://findyoganow.com/. This site allows you to search for yoga classes by your zip code. I use it all the time while I am traveling and its different from many other sites. It actually shows the class time and location, as oppose to just the studio. I like this because it eliminates a lot of the clicking and browsing that other sites make you do. I really really need this. I have no money. I live on a disability pension and I need this to be close to free as possible.